Max Holloway likes the UFC’s new design of their belts, as it draws similarities to the popular kids TV show Power Rangers. UFC featherweight champion Max Holloway is a fan of the UFC’s new belt design, as it reminds him of the children’s TV series Power Rangers. Holloway takes on Dustin Poirier in a rematch for the interim UFC lightweight title this Saturday night in main event of UFC 236. “Blessed” will move up a weight class and make his UFC lightweight debut on the night. 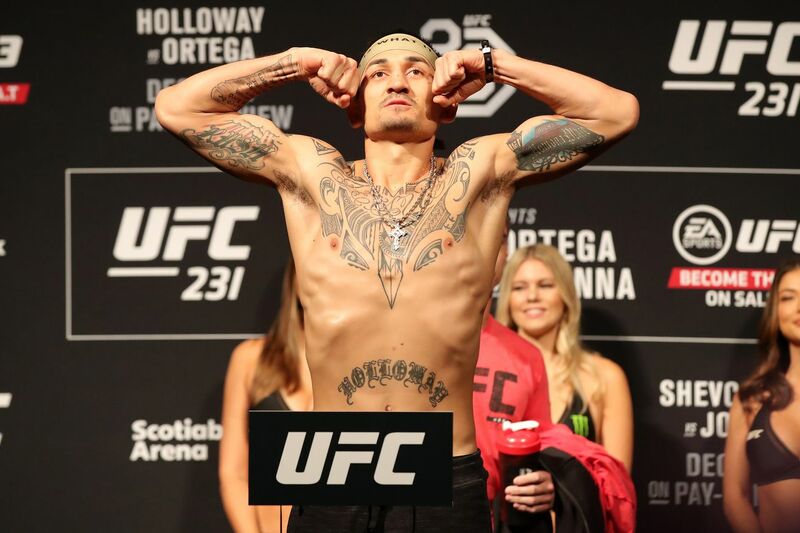 A huge featherweight standing at 5”11, Holloway addressed those who say he struggles making the 145-pound limit, and he discussed how to make the lightweight limit still requires a weight-cut, but being able to eat more food is a massive plus point. “The best part of life for me right now at 155 (pounds) is eating. I get to eat. You know I ate a lot at 145, but I get to eat a lot more at 155. It’s great, it’s still a (weight) cut but it’s not a 145 weight cut.” Holloway said. “Everybody keep’s giving me a hard time about the weight, but never ever have I missed weight in my career. The doctors came in and stopped it, I don’t know what for, the first time, and the other times weren’t even weight-related. Holloway joked at those saying he has the chance to become champ-champ on the night, as it’s only an interim title on the line in his fight with Poirier. UFC 236 takes place this Saturday night, April 13th, at the State Farm Arena in Atlanta, Georgia. Holloway vs. Poirier 2 will headline the card, whilst Kelvin Gastelum will challenge Israel Adesanya in the co-main event for the interim middleweight title.